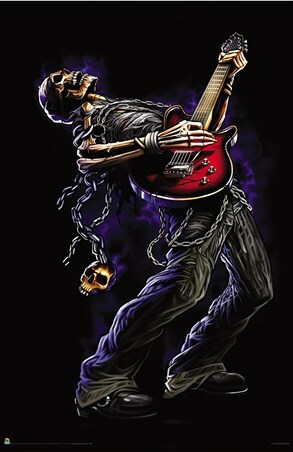 Art Maxi Poster: Standing in the darkness with a purple aura surrounding his mummified skeleton, this timeless rocker gets ready to jam with his trusty guitar. With skulls and chains hanging from his animated corpse, he slings his head back and proceeds to mosh out to the sounds of his deadly power chords. Perfect for rock stars and gothic art lovers, this sensational maxi poster is sure to make a chilling addition to your bedroom wall.